Here are some links to other Doll web sites. Visit these to see the works of some very fine doll artists. Adorable Doll Clothes and Doll Accessories for dolls 9-24 inches such as the American Girl® doll, Ashton Drake® doll, Baby Alive® dolls, Berenguer® dolls, Bitty Baby® doll, Baby Alexander® doll, Cabbage Patch® doll, Corolle®, Dora The Explorer®, Effenbee®, Gotz®, Lee middleton®, Little Mommy®, Lissi®, Madame Alexander®, Magic Attic®, My Twinn® and Zapf Chou Chou® dolls. Adventures in Ceramics Ready-to-paint bisque Front Porch Collection dolls, more. Berry Patch Dolls Original Limited Edition porcelain dolls by Carolyn Jones. Black Dolls to Love collectible dolls and figurines We specialize in porcelain and vinyl collectible dolls, children's play babies and figurines. We carry popular designers like Lee Middleton, Berenguer, Corolle and Madame Alexander. Ceramicmolds.info "The greatest web site for Hobby Ceramics information on the Internet." Creative Glazes We sell Duncan, Gare and Mayco glazes, ceramic cleaning tools, Orton cones, kiln wash and various other items needed by today's ceramists. Doddie's Collectible porcelain and vinyl Dolls Ltd. Edition porcelain and vinyl dolls and vinyl playbabies for children. Dolls from well known artists and manufacturers of affordable quality dolls. Lee Middleton Dolls and ethnic dolls as well. Dolls Realistic Dolls Realistic features vinyl collectible limited edition dolls & vinyl and cloth play dolls, doll furniture, doll accessories, and doll clothes for children. Just like holding a live baby; lifelike baby doll. Dolls and Lace.com Specializing in antique dolls and bears, antique doll clothes and accessories, antique fabric, lace, trims and victorian accessories. Doll Artisan Magazines DOLL ARTISAN is dedicated to the reproduction of classic antique porcelain dolls. Gillian Richards Dolls, Dollshouses and Miniatures shop (UK) A huge range of porcelain dolls, bears, dollshouses, kits, furniture and accessories. Learn to make porcelain dolls, bears and more. Har-Bon Ceramics and Decals Imported watermount decals. IFDM The International Foundation of Doll Makers site. Judi's Dolls Judi's Dolls Patterns for detailed, collector quality cloth dolls. Mandie Marie's Porcelain Products Quality soft fired greenware, including some of ours. Monique Trading Corporation Vendor of doll wigs, shoes, hosiery, accessories, and more. Porcelain Doll Makers Network Greenware, slip, molds, supplies of all kinds, finished dolls. Page's Dolls Specializing in modern and antique dolls, green ware, bisque, kits and doll supplies. Rita Rich Originals Excellent collection of original baby dolls. Riverview Molds One of the oldest and most respected mold manufacturers in the ceramics industry. Rose Pinkful Originals Quality Plaster Molds for Making Beautiful Porcelain Dolls. PCF Studios Figurative Sculpture, Porcelain Doll Molds, Sculpting Instruction. Sculptor.Org This resource for sculptors contains links to many fine sites on the web. Smallwood Village A miniature site with a difference. Stanec's Dolls Ltd. D.A.G. School of Dollmaking, Antique Dolls, Seminars, Dolls, Doll Making, baby dolls, modern dolls, reproduction dolls, original dolls, porcelain doll greenware, and just plain dolls. Discuss doll making with Certified Doll Artisan Guild Instructor in their chat room. TLC Dolls Popular play dolls, clothing and accessories. 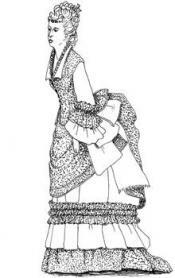 Vees Victorians We are a family business, making doll clothes since 1985, that fit dolls ranging from 6" to 36". 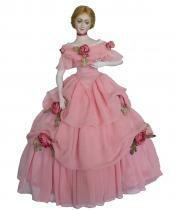 Our fashions fit modern, antique and vintage dolls; lady, China head and fashion dolls; baby dolls and more.